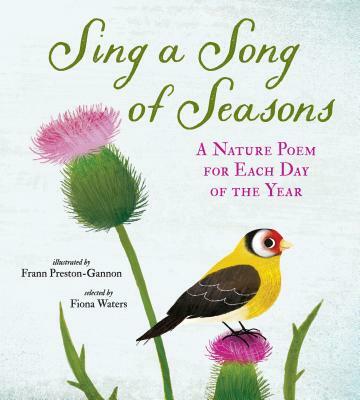 Sing a Song of Seasons is a lavishly illustrated collection of 366 nature poems — one for every day of the year. Filled with familiar favorites and new discoveries written by a wide variety of poets, including William Shakespeare, Emily Dickinson, John Updike, Langston Hughes, N. M. Bodecker, Okamoto Kanoko, and many more, this is the perfect book for children (and grown-ups!) to share at the beginning or the end of the day. Fiona Waters is renowned in the world of children's books for her passion, enthusiasm, and encyclopedic knowledge of children's literature. She has published more than eighty titles, and her work has been translated into many different languages all over the world. In 2006 she won the Centre for Literacy in Primary Poetry Award for her anthology "Why Does My Mum Always Iron a Crease in My Jeans?" Born and raised in Edinburgh, Fiona Waters now lives in the South of England with thousands of books and several very discerning cats. Frann Preston-Gannon is the author and illustrator of several books for children. She was the first U.K. recipient of a Sendak Fellowship in 2011, and in 2014 her first picture book, The Journey Home, was long-listed for the Kate Greenaway Medal. She is one-fifth of the design group Zombie Collective, which specializes in workshops and pop-up galleries. Frann Preston-Gannon lives in London. Paired throughout with Preston-Gannon's evocative, vibrantly textured digital illustrations, Waters' superbly curated poems offer something for everyone: majestic and inspiring as nature itself. Preston-Gannon offers a cohesive visual thread, with gentle mixed-media renderings of animals as well as urban and pastoral scenes. Readers are likely to discover greater nuances behind the accessible poems with each visit. Stunning mixed-media illustrations by Frann Preston-Gannon (The Journey Home) depict critters, environments and weather phenomena with lifelike textures and contrasts that pop. This anthology impresses with its captivating art, careful balance of melancholy and uplifting verses, and timeless themes of playing, observing, aging and enduring through the years. A less elegiac celebration of the countryside and its joys comes in a wonderful collection of poetry for children, ‘Sing a Song of Seasons: A Nature Poem for Each Day of the Year’ (Nosy Crow, 336 pages, $40)…Children ages 4-12 who pass a year with this book will do so in the thoughtful company of all sorts of poets, from Langston Hughes and Christina Rossetti to Ogden Nash and that most prolific of versifiers, Anonymous.